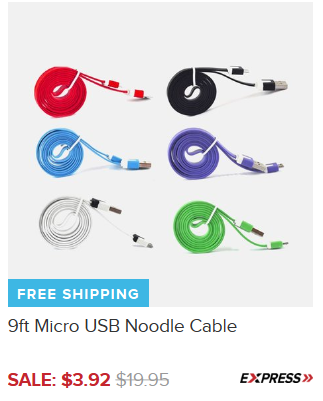 9ft Micro USB Noodle Cable Only $3.99 + FREE Shipping (Reg. $20)! You are here: Home / Great Deals / 9ft Micro USB Noodle Cable Only $3.99 + FREE Shipping (Reg. $20)! Wow! Right now you can grab an amazing deal on a 9ft Micro USB Noodle Cable for only $3.99 + FREE Shipping (Reg. $20)! And, if you are a VIP Customer like myself, you can get this for $3.92 shipped! To become a VIP, you just need to make 3 purchases. You’ll then get special VIP pricing, EXCLUSIVE deals just for you, and a 15% OFF coupon!